We went with some friends to the Dave Matthews concert last night at Piedmont Park. There were over 50,000 people there so it was a great time for baby to be exposed to some good music. I've been feeling huge lately so it was nice to get out and have some fun. 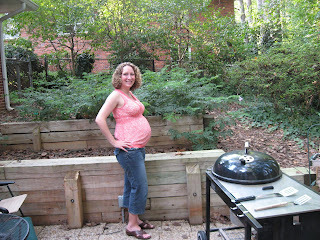 Here I am, wasting time on myspace...and I'm like "Is that a belly on Andrea?!?" so I come here, and find out that you're about to have a baby! Congrats! That's so exciting! I'll keep checking your updates on here. It's been a lot of fun to scroll back and see the whole pregnancy. oops. maybe you know more than one anna. it's fatty anna from middlebrook. p.s. fatty tiff just got married at the beginning of august, and I saw that Becca just had a baby boy this summer. man, how time flies. YEA! Baby Johnson is on it's way! 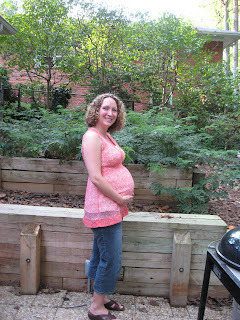 What a great idea to do the blog-- can't wait to met him, Andrea you look great! Great to see you at Devine's bday Don, Andrea we missed you. Good luck the next few weeks- we'll be thinking of you!